Beantown Bagger always likes to hear about local bike enthusiasts who pour their own blood, sweat and tears into their machines. One of these builders reached out to Beantown about a winter project to which he will subject his 2004 Harley Davidson Road King. 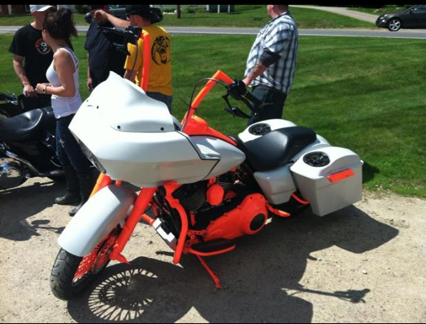 Andrew Snow plans a major revamp of this classic bagger and he will be sharing pictures and stories throughout the entire process with the loyal readers of Beantown! To start this series, we sat down to interview Andrew about his background before the Road King and the goals of the project. 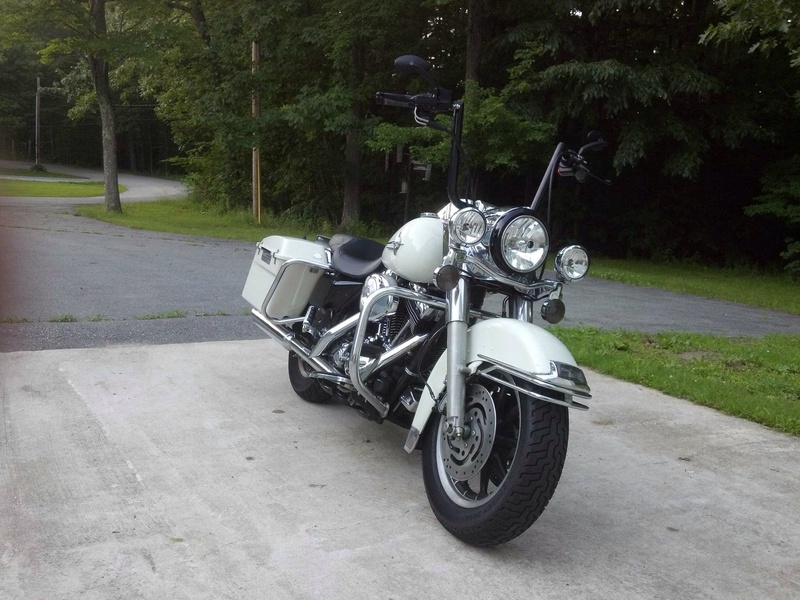 Beantown Baggers: Andrew, was this 2004 Road King your first bike? Have you always been a Bagger? Andrew Snow: No, Actually I was always a crotch rocket type of guy till November of 2012 when I sold my 09 Kawasaki zx-6. I had planned to take some time off from riding, but in march of 2013 I fell across this 2004 Harley road king. 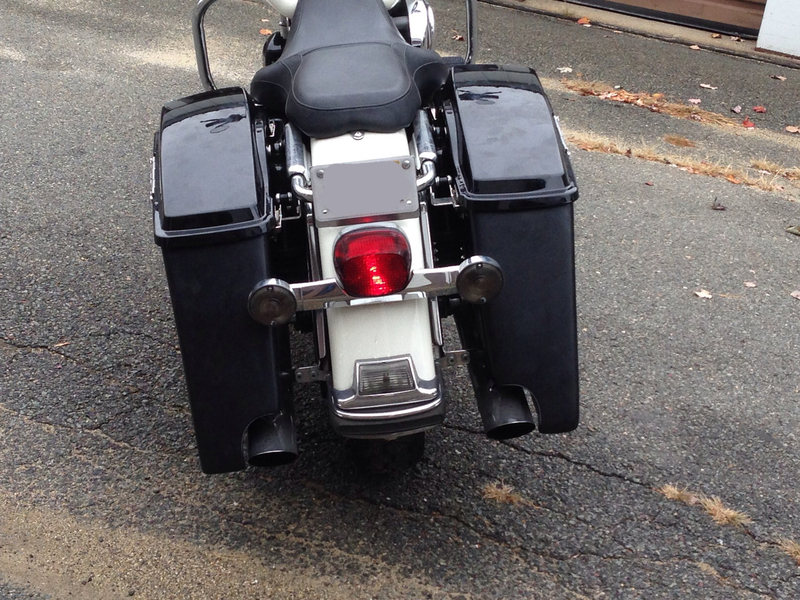 Beantown Baggers: I won’t ask why you were taking time off of riding – personal reasons no doubt, but what pulled you back to the road? Andrew Snow: The Road King was a deal I couldn’t refuse. When I finally hit the road I realized the freedom that comes with a Bagger. Andrew Snow: A buddy of mine, Josh McKinnon was a major influence. 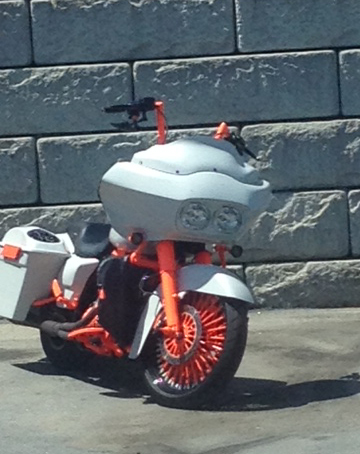 He rides a 2012 Road Glide that was painted white and fluorescent orange. (See the pictures below from the BestFN Bagger Contest). I decided I wanted to build a sweet bagger, something I could be proud of. Something that will cause heads to turn! Beantown Baggers: What’s your plan? What parts are you using? 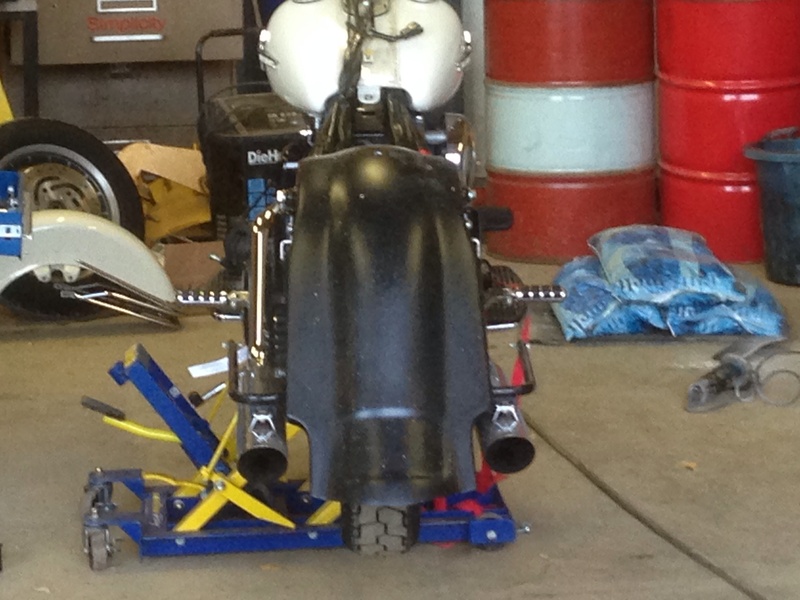 Andrew Snow: I’ll start with 4″ stretched bags and stretched rear fender. 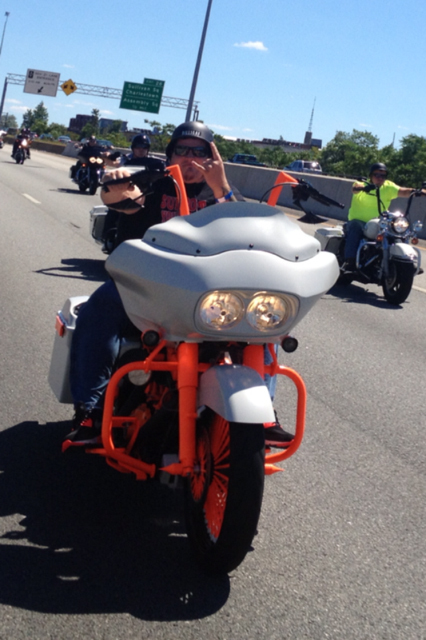 The handle bar will be a 14″ z bar and a Street Glide front fender will house a 21″ fat daddy front rim. Beantown Baggers: I guess that all is left will be picking out the color! Andrew Snow: I’m doing a Bahama blue paint with white trim. I wanted to do mine different because these days everyone combines paint with black trim. Beantown Baggers: Have you ever worked on something like this? 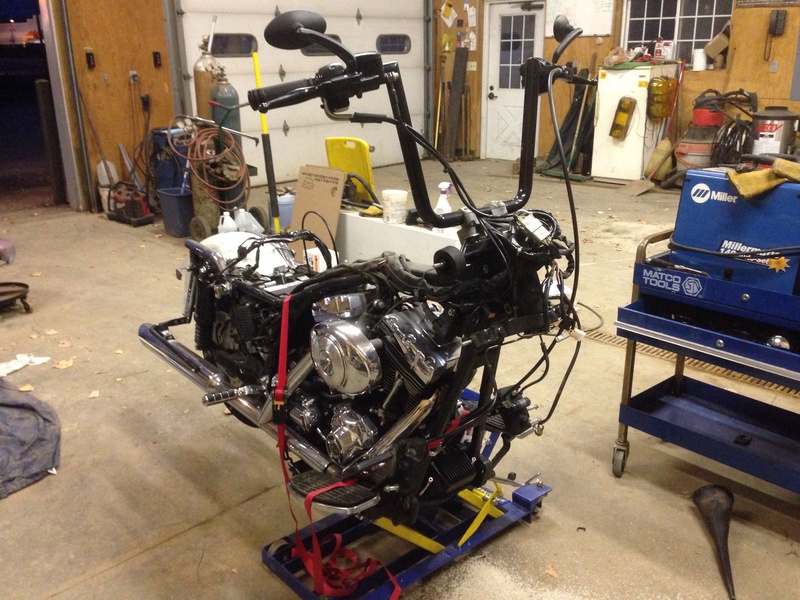 Andrew Snow: I have never before customized, fabricated or even worked on a Harley before! This has been a complete learn as I go experience and with a lot of help from friends and YouTube. It was a spur of the moment project but I could not wait to start, so unfortunately my riding season got a bit short. Regardless, I’m having a lot of fun doing it! Beantown Baggers: That’s what it’s all about! Will it be ready by spring? Andrew Snow: The project is coming together really well and with any luck I might just have it ready to ride before the first snow fall!!!! Beantown Baggers: We wish you luck and look forward to seeing the progress of this build over the coming months. Check back here for Andrew’s Bike Build progress.